Recently there have been an explosion of silicone accessories that are used to help apply skincare and cosmetics to the face and body. And rightly so. Silicone makes the perfect medium for applying products as it does not absorb product, thus it is less wasteful than using a brush or a sponge. Also, silicone glides easily over the skin making is easy to apply products and as for makeup, it allows you to blend foundation in quite easily. The Skin Slipper, the product I am reviewing today, is primarily for skincare but could be also used for cosmetic products too. The great thing about the Skin Slipper is that it puts product where it belongs and nowhere else. It prevents fingers from being exposed to irritating, unpleasant ingredients such as AHAs. It eliminates waste, it will not absorb your costly products, leaving more to go on your skin. It glides smoothly over the skin, spreading product evenly. Easy to clean with soap and water. Can be used over and over again. Skin Slipper enables the application of medicinal and cosmetic products to the skin easily, comfortably, and effectively. 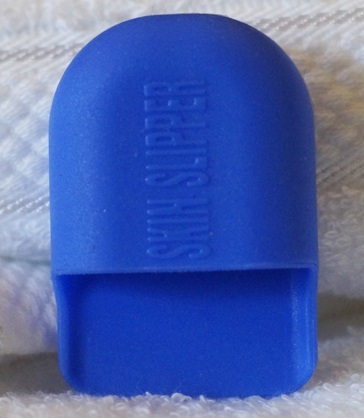 To use the Skin Slipper, place index and middle finger inside the Skin Slipper. 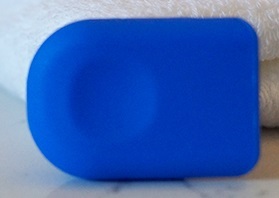 Turn over and place product into the recessed circle. Gently glide over affected area to evenly apply product. Wash Skin Slipper thoroughly with soap and water after each use. This product is constructed of hypoallergenic silicone material, meaning it is latex-free, pliable, non-absorbent of product ingredients, and water impervious. The side used to apply products is textured and padded to enable the user to easily guide the implement over the surface of the skin. Simply slip it over your pointer and middle fingers, and you're ready to go! After application, just rinse Skin Slipper to make it ready for future use. Skin Slipper is very easy to use and makes skincare products easier to put on, I found it so easy to use. I have seen silicone applicaticators but this is the original. I like that it has a place for your finger so as to get an accurate application. I wish it was more suited to use foundation with. I think using it for makeup is a good choice, one that most will appreciate. Skin Slipper retails for $11.99 and can be found online at www.skinslipper.com and at the PETSTAURANT (San Fernando Valley) in Sherman Oaks, CA.